HomeShould we throw out the chlorhexidine with the bathwater? Should we throw out the chlorhexidine with the bathwater? Following hot on the heels of a series of studies showing that daily bathing using chlorhexidine reduces the risk of HCAI, a recent study suggests that chlorhexidine daily bathing does not reduce HCAI. 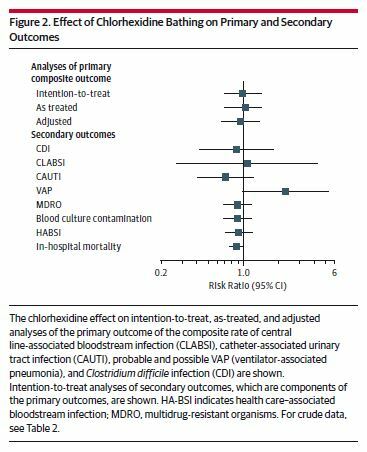 The headline finding is that chlorhexidine bathing did not reduce HCAI. Before throwing out the chlorhexidine with the bathwater, it’s worth considering the limitations of the study. This was a single centre study run over a 12 month period. Although the study design is powerful and involves randomisation, it does not have the sample size of other chlorhexidine studies. Despite there being around 10,000 patients, the primary outcome (a composite measure of HCAI) was only met in 55/60 patients in each arm. There was no active surveillance in place on the units. This means that it was not possible to determine the acquisition of MDROs (negative on admission with a subsequent positive screen). It seems likely that chlorhexidine daily bathing of the skin would interrupt more transmission events than it would infections, since many of the infections in this study would have been endogeneous. The study design may have resulted in confusion for staff. The staff were given 10 week blocks to use either chlorhexidine cloths or standard cloths. There’s a good chance that chlorhexidine cloths would still have been around in the standard period (although the authors tried to stop this happening), and vice versa given how little hospital staff like throwing things away! Even when chlorhexidine cloths were available, they have to be applied correctly and recent data suggest that this is not often done well. There was no measurement of compliance with policy in the study – and certainly no measurement of the concentration of chlorhexidine on patients skin! There may not have been enough time for the effect of chlorhexidine to amplify. It seems likely that there would be lead-in period to the maximum effectiveness of chlorhexidine daily bathing (with patients who have been treated using standard cloths harbouring new HCAI or colonization that doesn’t manifest until the subsequent chlorhexidine period). There was a wash-out period, although this really an additional control period, with daily bathing using standard cloths. This could have played an impact, and certainly argues for longer blocks. It’s not clear why they didn’t just do one cross-over at the 6-month point. This potential limitation is acknowledged by the authors in the discussion. The study was not blinded. Although this is unlikely to affect the outcome, it may have introduced some bias one way or the other. For some reason, the patients in the chlorhexidine were more likely to have respiratory disease (p=0.03), which may have increased their chances of VAP, which was included in the composite HCAI primary outcome. This is supported by 17 cases of VAP in the chlorhexidine arm vs. 8 in the control arm, which was an apparent significant difference in the as-treated analysis. difficile was included as part of the primary outcome. This seems a strange choice, since chlorhexidine is not effective against C. difficile spores! This is an interesting and important study, and should serve as the basis for further research to determine whether and to what extent chlorhexidine daily bathing reduces the risk of HCAI. ← Is CRE lurking in nursing homes?